we thank you for your service to the community. You have an important job to do and people rely on you to always be there. You can trust Diversified to fix your vehicle and get you quickly and safely back to work. If your vehicle is in need of collision repair Diversified is a one-stop-shop for you. Our estimators will provide an evaluation for work detailing what body work, paint and/or frame and alignment services are needed. 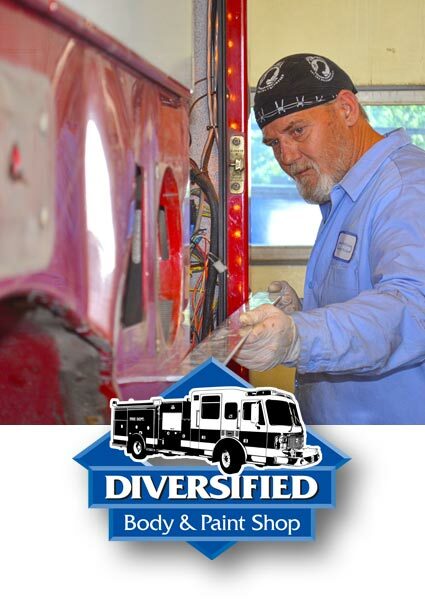 Diversified uses expert equipment and certified technicians to repair emergency vehicles of all types and makes including fire trucks, ambulances, and other types of emergency vehicles. Maintaining consistent colors on your vehicle is important so that your team and the community instantly recognize who you are when you are on the road. From painting the top of a cab to painting the whole vehicle, Diversified uses the highest quality DuPont warranted paints and procedures for maximum durability, maintenance and appearance. Emergency vehicles endure harsh environments and use. This can cause wear, rust and corrosion. Diversified can restore the damaged parts of your vehicle to a safe, operational and like new condition.